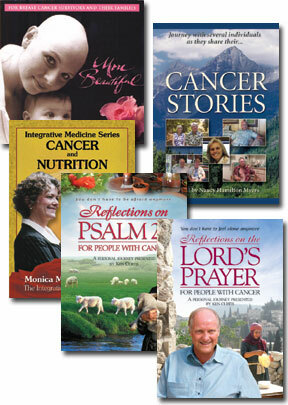 This set of five includes the DVD/CD set More Beautiful and the DVDs Cancer Stories, Integrative Medicine: Cancer and Nutrition, Reflections on Psalm 23 for People with Cancer and Reflections on the Lord's Prayer for People with Cancer. More Beautiful DVD/CD set -- This 40-minute DVD includes a music video, and documentary and interview pieces featuring interviews with breast cancer survivors. The CD features songs, poetry readings written by breast cancer survivors and beautiful, contemplative guitar pieces. Cancer Stories -- ?These intimate, honest, and emotionally moving programs cover the experience of various individuals as they fight their own life and death battle against Cancer. The stories are as varied as the people telling them. They include a NASA space engineer, a sports champion, successful career men and woman, children and housewives, moms and dads, all battling various forms of Cancer. Host of the programs is Nancy Myers, who herself has experienced Cancer and approaches the subject through a sensitivity born of her own experience. Join her and the many individuals the program visits as they collectively “tour guide” you through the maze of Cancer! ?Two segments, approximately one hour each. Integrative Medicine: Cancer and Nutrition -- ?Integrative Medicine combines conventional medicine with Complementary and Alternative Medicine. It cares for the whole person -- mind, body, spirit and emotion. Dr. Monica Myklebust continues her series on Integrative Medicine in this video treating cancer and nutrition as well as other dimensions of addressing cancer with an integrative medical approach. She answers vital questions that will help patients and their loved ones with care for the whole person through compassion, knowledge and spiritual resources. She also goes into detail about the proper nutrition needed for cancer patients. The correct food and liquids are very important. “Food is medicine,” she says, especially when you choose well those foods that will help you through your journey. The DVD includes a 10-minute bio on Dr. Monica. Reflections on Psalm 23 for People with Cancer -- Ken Curtis explores coping with advanced cancer from personal experience based on the inspiration of the 23rd Psalm. Ken was diagnosed with advanced cancer with little prospect for survival. He pursued a combination of traditional and alternative medicine, undergirded by a strong spiritual dimension and prayer support team. Psalm 23 was a vital part of his spiritual component, and for this video Curtis went to Israel, home of David and the Psalm, to be with the shepherds, travel "through the valley of the shadow of death," and explore and enjoy the healing powers of the green pastures and still waters. The resulting 13 meditations provide a combination of candid personal experience of what it means to battle cancer and some of the spiritual resources available through this time-honored Psalm. Includes a study guide in PDF and additional material related to Psalm 23. Reflections on The Lord's Prayer for People with Cancer -- This series of meditations on The Lord's Prayer with Ken Curtis builds upon his previous series, Reflections on Psalm 23 for People with Cancer. While made particularly for people facing the crisis of cancer, the reflections are relevant for any health crisis. Join Ken on this journey into the world of The Lord's Prayer from original locations important in the life of Jesus. The Lord's Prayer is not just a way of praying. It's a way of "seeing." When the prayer is grasped and uttered from the heart, it can -- and will --change us. We realize how we are not alone, no matter how difficult or seemingly hopeless our situation. Even in our pain, there can come a joy and a feeling of rightness about our world. Ten 8-minute segments. Includes optional English subtitles, a study guide in PDF, and additional material related to The Lord's Prayer.